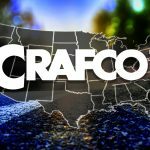 Crafco Mastic One is designed for large cracks and distressed surface areas too small for re-paving. Ideally used to fill distresses. 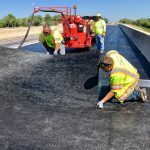 It is a versatile hot-applied, pourable, self-adhesive ridged asphalt binder containing selected aggregate to ensure good load bearing and skid resistant characteristics. Mastic One is compounded with standard weight aggregate. TechCrete by Crafco is a hot-applied repair mastic sealant, aesthetically suitable in all concrete pavements, and is used in sealing wide cracks and joints, as well as repairing a large variety of pavement distresses. 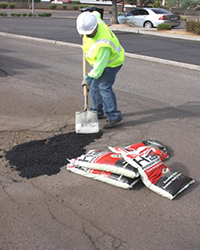 Whether it is repairing utility cuts or patching that reoccurring pothole, HP Asphalt Cold Patch is rapidly becoming the material of choice. HP Asphalt is specifically formulated for the wide-ranging temperature and climate of your area. HP Asphalt Cold Patch comes premixed and ready to use. 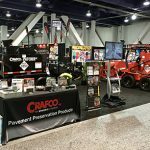 Crafco HP Concrete Cold Patch is a unique, gray color, cold applied, single component patching material. 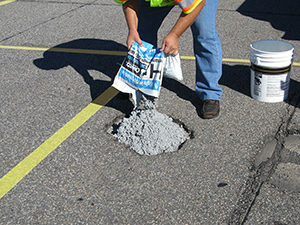 Use HP to repair potholes, spalls, cracks and other confined voids and distresses over 1 inch wide and greater than ½ inch deep in Portland Cement concrete. It can also be used to repair roads, highways, streets, airport pavements, parking lots, bridge and parking decks, sidewalks, walkways and floors. Unlike most other concrete patching materials, no mixing, heating or special installation equipment is required.